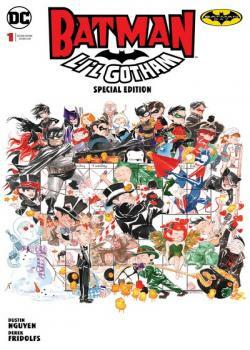 Just in time for Batman Day 2018 on September 15, DC presents the first issue of the series written and illustrated by Derek Fridolfs and Dustin Nguyen! It's October 31st, but Robin needs Batman's help to learn the true meaning of Halloween...CANDY! And will Robin be able to tell the difference between the real evildoers and costumed children, or will the kids get clobbered while the villains escape? !